After taking on the role of Artistic Director at the Vancouver Tap Dance Society I’ve received many questions about what my future career would look like. Would I continue to perform? Yes. Would I continue to speak? Yes. How many classes would I be teaching in Vancouver? I wasn’t exactly sure when I first landed. I can now answer the final question. Here’s the schedule of new classes that I will be teaching at the VanTap Academy in 2019. I’m excited to join the awesome faculty at the Academy in sharing the joy I’ve found in tap dancing. If you want to save your slot, registration is now open!! THREE hours of intense tap dance training with VanTap Artistic Director, Andrew Nemr. Get down for any of the 1 hour classes or take all 3 for a full effect. Hour One – Technique – Steve Condo’s style Rudiments, Traveling Steps, Air Steps, and Turning Steps. Check your chops. There will be no hiding allowed. Hour Two – Choreography – New choreography will be built each month. Modeled after Andrew’s experience in Savion Glover’s TiDii and his own tap dance company Cats Paying Dues, choreography will be ensemble-based and focused on listening, dynamics, and moving through space. Hour Three – Improvisation – The circle, trading 8’s, the time step, the song as improvisational structure, groove based playing, and more. All these improvisational structures will be explored with the goal of gaining familiarity and confidence in making strong choices. DATES: January 11th, February 8th, March 8th, April 5th, May 3rd. Have you ever wanted to try tap dancing? Missed out on your opportunity as a kid? Now is your chance! 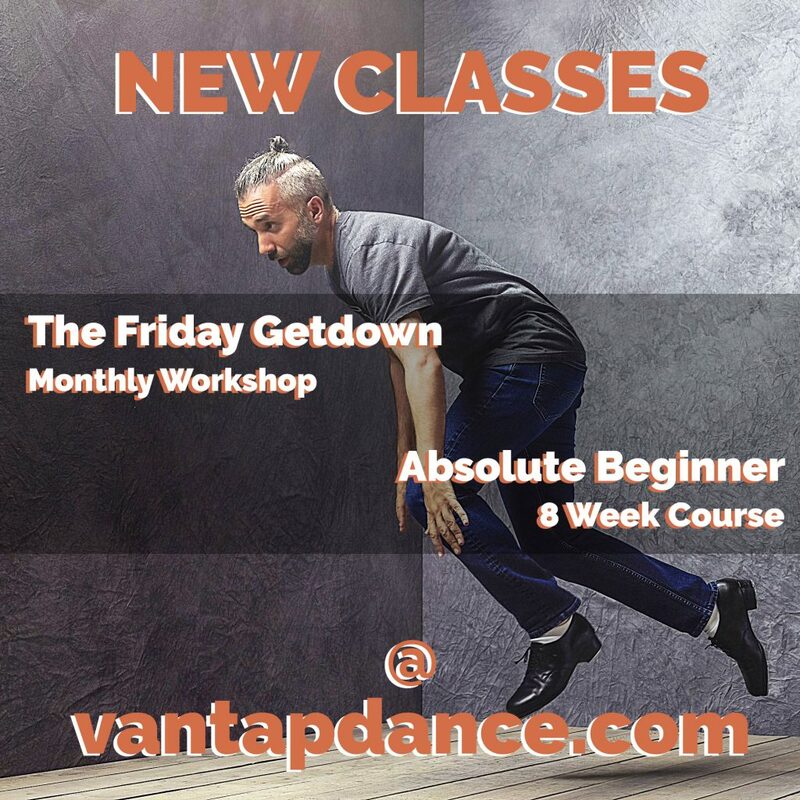 This 8 week course is geared towards anyone interested in learning how to tap dance. No prior experience necessary. DATES: Every Saturday, January 12th – March 2nd.